Earlier this year, our family vacation at Walt Disney World just happened to coincide with our wedding anniversary! We could not let this opportunity go to waste. 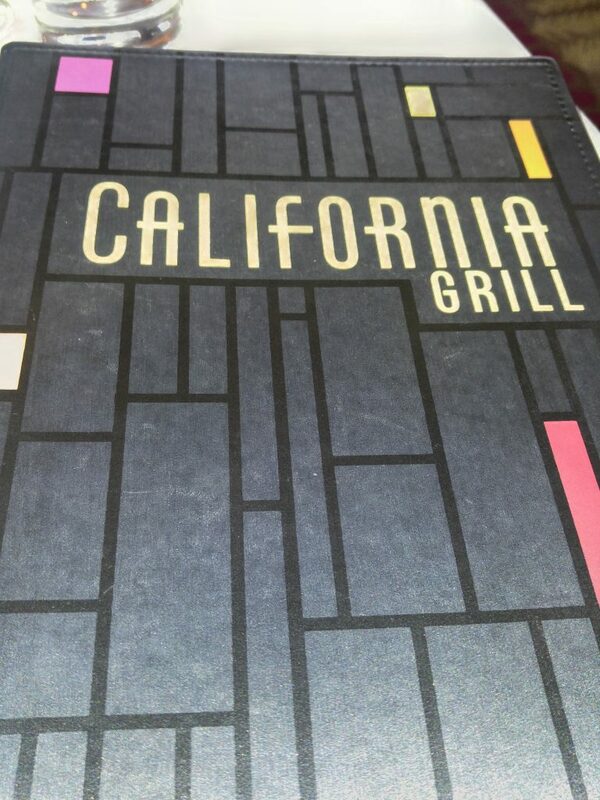 Neither of us had ever been to the California Grill, it is honestly a bit out of our price range for a family meal, but our anniversary provided the perfect chance to splurge on a special night out. (Believe me, those are hard to come by with 2 little ones in the house!) Luckily, we were traveling with friends, and had a gracious babysitting offer. Before we get to the food, a few housekeeping, err mousekeeping, items. 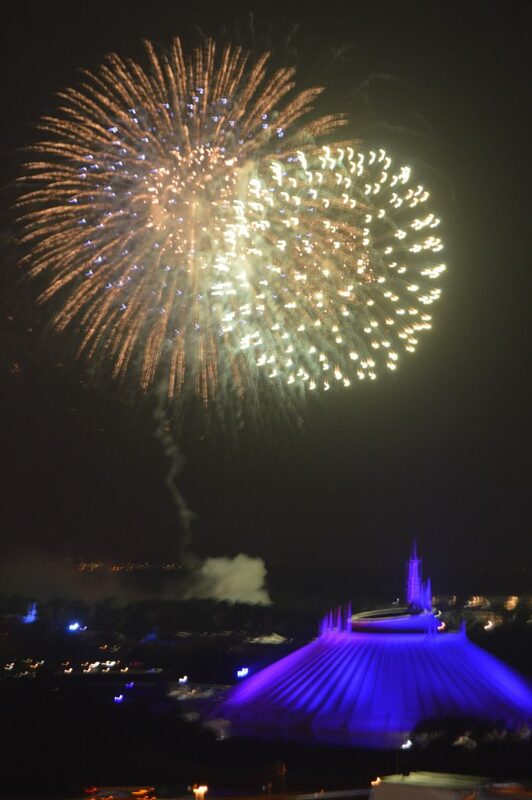 Reservations, especially at prime dining hours or near firework time, can be difficult to come by. Definitely try to take advantage of the 6 month reservation window, you may very well need it. If you aren’t able to secure a reservation, check back often. We were able to get a 7:00PM dining reservation approximately 2 months out by checking (and rechecking!) for openings. If you are staying onsite you can utilize Disney transportation to visit the California Grill. If you are staying offsite and have a car, you can park at the hotel. Be warned, they will ask for ID and may ask for your reservation. The Contemporary Resort is a tempting place to park if you want easy access to the Magic Kingdom. The hotel obviously knows this and wants to rightfully limit parking to guests/restaurant patrons etc. Upon entering the hotel, we had to ask the front desk for assistance in how to actually get to the restaurant! The restaurant has its own “special” entrance. We were directed to the escalator to the 2nd floor. There, we spoke to a hostess to check our reservations. We were then escorted on a employee staffed elevator to the California Grill. (It is kind of fun to feel “exclusive” every once in awhile!) We inquired if the fireworks would still go on as planned with the rainy weather; we were assured they would as they are very rarely cancelled. 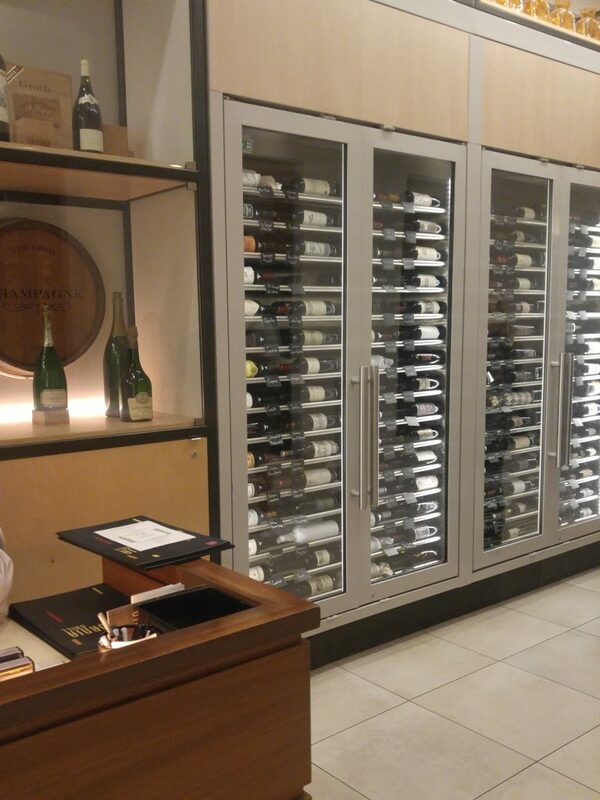 The elevator opens directly to the beautiful wine filled lobby. We checked in and provided our phone number to receive a text when our table was ready. No sooner did we sit down at the bar to order a drink when my phone buzzed. Total wait time less than 5 minutes! We had requested a window table. Unfortunately, this was not accommodated. We were given an option to wait, but were not given a very concrete time window. We had gracious friends watching our children, so we didn’t feel comfortable waiting, but this may be an option for some. But, the view was still beautiful (and rainy) from our location. Our table was along a row of bench seating; one individual sitting on the bench, the other on a chair. Be warned, this may not be the most private of dinners, our table was quite close to our neighbors. But, we made the best of it and enjoyed a quick conversation with those beside us. 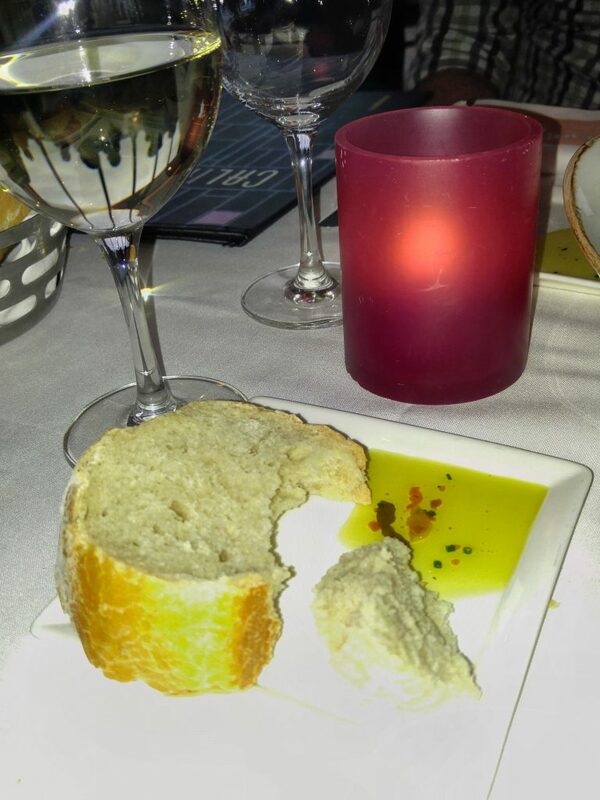 Each table receives a delicious, and addictive bread service and dipping oil. Our waiter, as I am sure most California Grill waitstaff are, was quite attentive and helpful. He was quite knowledgeable regarding the beer and wine list. 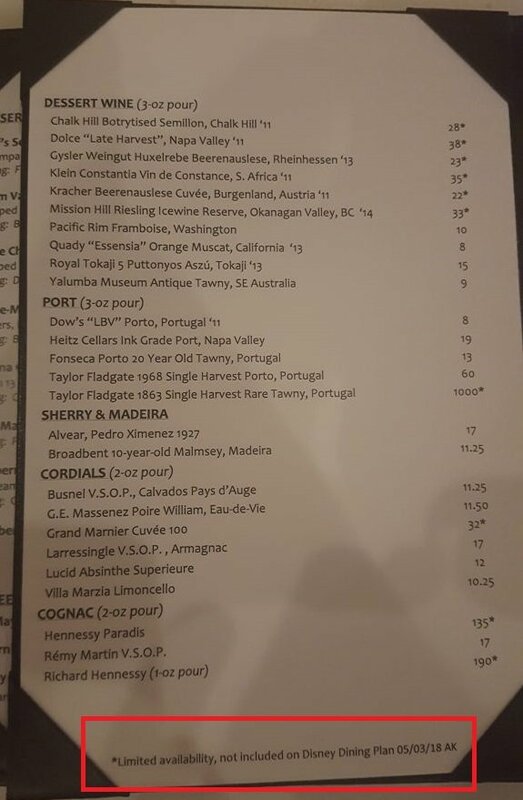 My husband, the craft beer connoisseur, selected the Napa Smith Hopageddon. It was well rated on a number of craft beer sites and he was impressed. I prefer wine and choose a sweet Reisling. 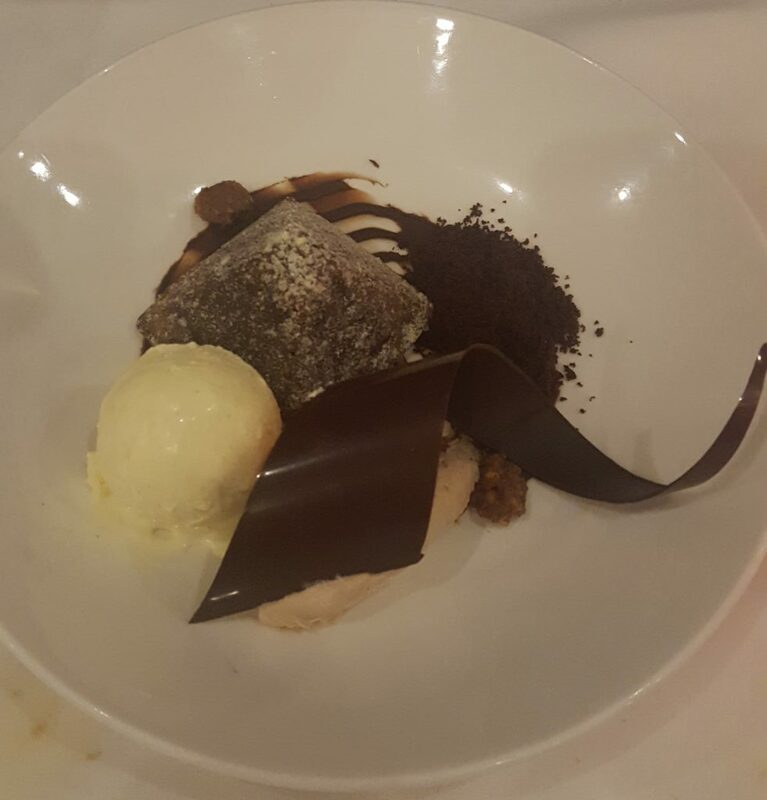 We choose to forego appetizers, as we had our minds on dessert instead. 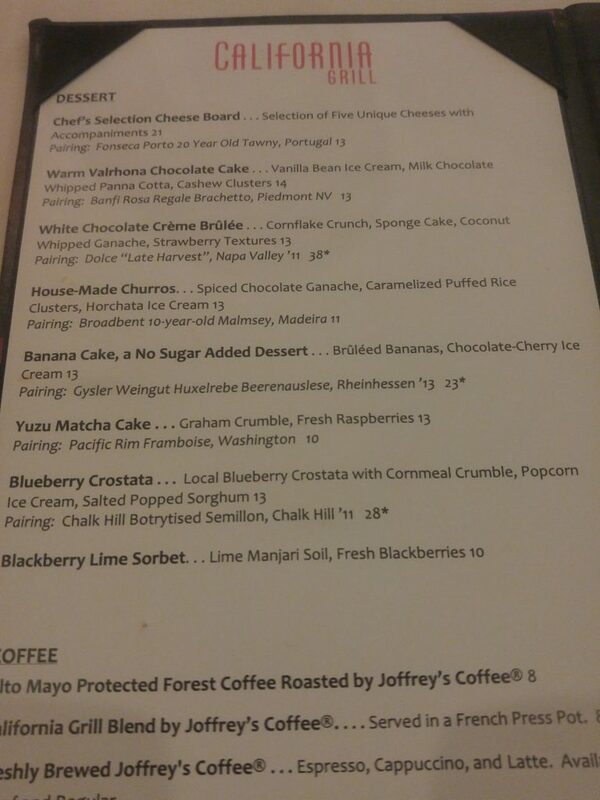 But there were a number of tempting options. I even considered choosing an appetizer in place of an entree. (those short ribs were calling my name!). 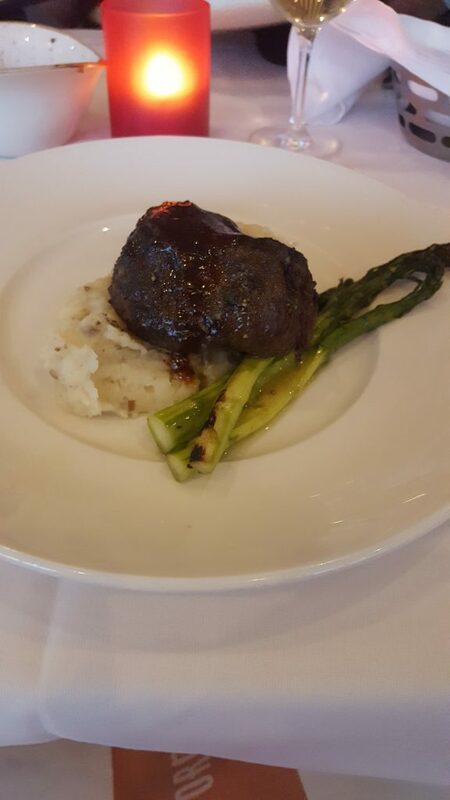 My husband selected the Oak fired Filet of Beef medium well, served with asparagus and mashed potatoes. He has since said it is one of the best steaks he has ever had. I choose the pork tenderloin. The waitstaff was again, quite helpful. I was not a fan of the offered side items and was able to pick and choose from the other entrees. I did, however, have to pay an upcharge ($12) for the Aged Gouda Mac & Cheese. I was informed this was the only side item that required an additional charge. I would normally decline, but, it was our anniversary and I REALLY wanted it. 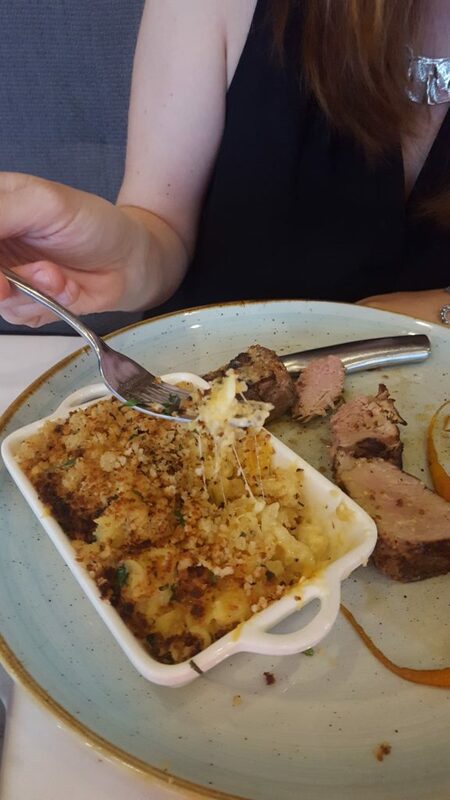 It was totally worth it, possibly the best mac & cheese I have ever had! 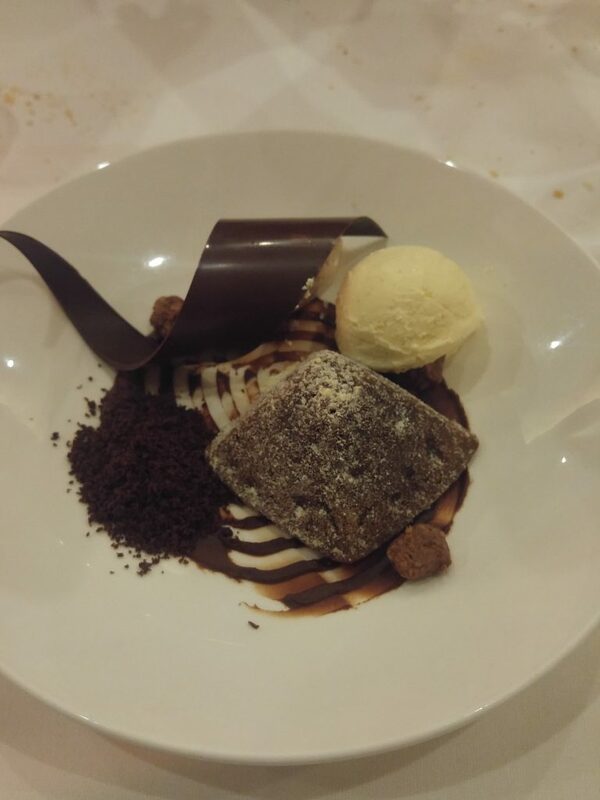 (But a word of advice, it is quite rich and as good as it was, I could not finish it). After desert, we casually enjoyed our remaining wine and beer. We were not rushed and our leftovers were nicely packed and bagged. 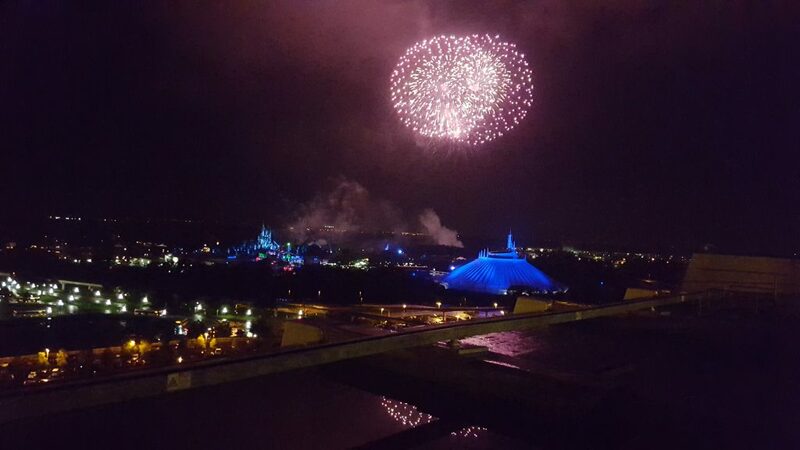 California Grill is known for its food and wine, but it is probably equally known for its wonderful fireworks viewing location. They can be watched from inside, or from a outdoor viewing deck. After dinner, we had about a half hour before the fireworks began. We decided to take a quick look at the hotel shops as we waited. When we were ready, we came back to the hostess stand and were quickly escorted back to the restaurant. 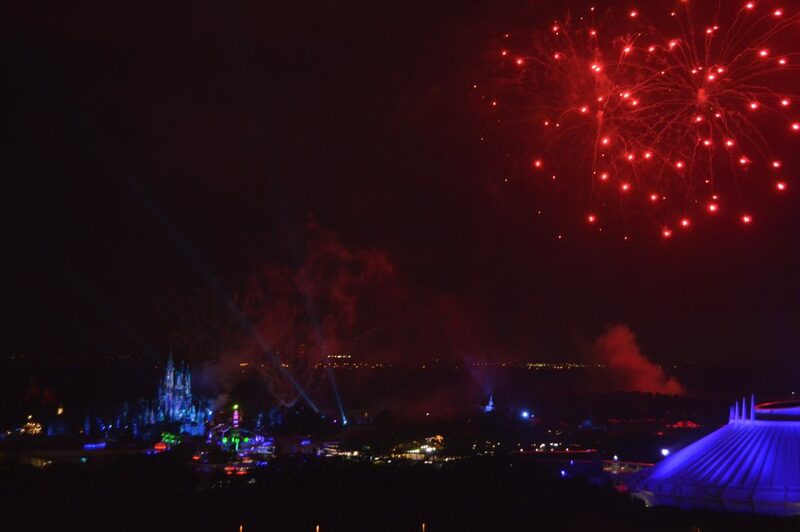 The clouds had finally decided to disperse and we were treated to a rain free fireworks experience. Full disclosure, we rarely watch the fireworks at the park; our kids hate the noise and I hate being packed in like a sardine! So, this was the PERFECT location for us. 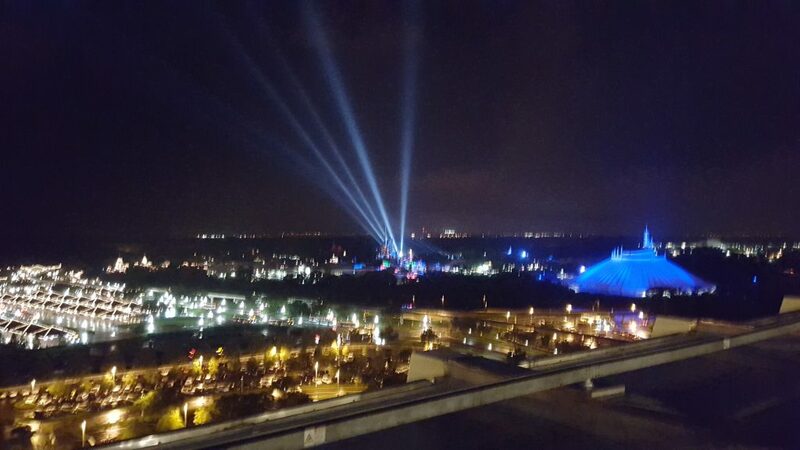 The music is piped into the restaurant and onto the viewing deck, making the experience even better. In addition, I was able to bring a glass of wine from the bar. Wine + Fireworks? Yes, please! We loved it. 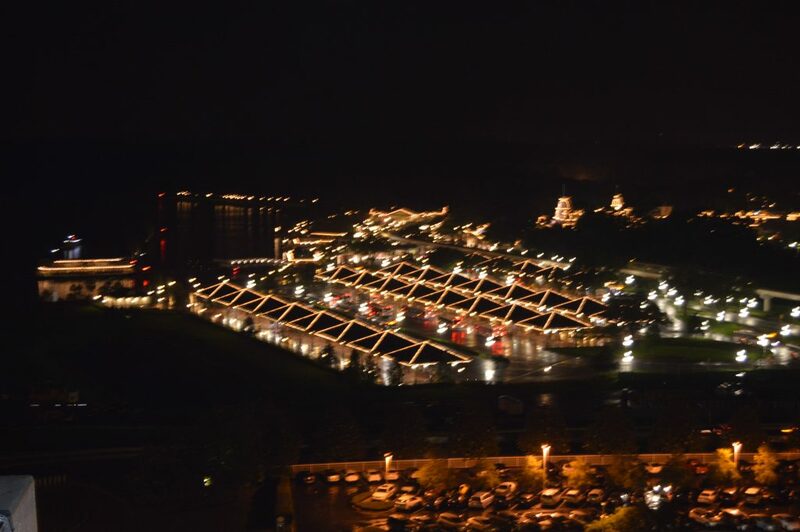 The atmosphere, the food, the wine, the view and fireworks all added up to a very memorable anniversary. The total bill with tip came to roughly $200. We felt this was a reasonable (for Disney!) price for the wonderful experience. The only negative was the somewhat cramped seating arrangement. This was not true for all seating, but was the case for us. We would love, and hope to go back again in the future. P.S. One menu item did make us giggle.